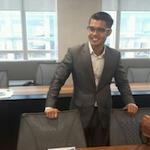 Fadli is currently a cyber threat intelligence analyst focusing on cyber activism and cybercrimes on Asia-Pacific with a deeper concentration on South-East Asia. He also has a huge interest in researching and understanding the TTPs of nation-states’ actors and their evolving modus operandis. He has spoken in several conferences worldwide such as in BSides and DefCamp and enjoys sharing his research to both the cyber security and threat intelligence communities.